Carbonate rocks are of fundamental importance in many respects: in the manufacture of cement, as building stone and aggregates, and they form the reservoirs for about 40% of the world's oil reserves. In engineering terms they frequently underly the most intractable geotechnical problems and often provide the foundations for coastal structures and offshore structures. 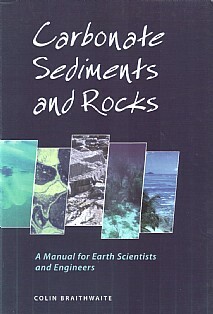 This book provides the geological background to carbonate sediments and rocks and furnishes basic information on the compositions, origins, and distributions of carbonate sediments. The descriptions that follow provide models for the earth scientist and a predictive framework for engineering works in such areas. It provides a basic reference tool for the geologist and a reference framework in which the practising engineer unfamiliar with terms is able to understand and evaluate reports provided by experts from other fields. Case studies provide further elucidation. Mineralogy and composition of carbonate rocks and sediments; Marine carbonate environments; Evaporites associated with carbonates; Continental carbonate environments; Geological classification of carbonate rocks and sediments; Carbonate diagenesis; Dolomites; Physical properties and tectonics of limestones and dolomites; Karst; Pedogenic carbonates; Engineering characteristics of carbonate rocks; Hydrological aspects of carbonates; Case studies; Bibliography. Practitioners and students in earth science, engineering geology, petroleum geology, foundation and civil engineering.